This article was contributed in 2002, just as the Winsham Web Museum went on-line. The new additions are clearly identifiable. Access 'Nerds Index'-an archive of ancient technical stuff by Clicking HERE. At the time of the Diamond Jubilee Anniversary Third Edition (2012), peoples' perception of historical event is changing, especially for those events which took place in, and since the 20th century, and have been captured by film and sound recording. The digital revolution which is providing ever increasing access to these records by television, radio and on-line vehicles such as YouTube, Google, Wikipedia, and the rapid growth in Blogging, Twitter and Facebook is increasing awareness of the ferment of modern day life. The Winsham Web Museum is proud of the small part it plays in this information explosion, but prides itself on doing it quietly! However on one of our pages to can hear a robin sing-can you find it? The origins of Winsham are hidden in the mists of time. Certainly it was in existence since long before the Norman Conquest and its name is of Saxon origin. The Fosse Way runs at the edge of the parish so there may be a Roman association, but nobody can be sure of this. The hospitality offered by its natural features suggests that it would have been an ideal place of settlement for any community during recent millennia. It is a pretty place, situated on a small river, the Axe, and nestling in a small wooded valley, protected from the strong south-westerly winds which from time to time race in from the sea, some ten miles away. The parish that includes five hamlets, is home to about 750 people, and covers approximately ten square miles. Situated about four miles from Chard, on the road to Bridport, it was agriculture that provided the reason for its continuing existence. A century ago there were many small farms. Now there are many less, and with mechanisation, only a few people working on them. About a third of its population is retired, but importantly for the initial Museum project a good proportion of these belong to the old village families who have lived in the parish for generations. There are some two hundred children, whose parents for the most part now do a wide variety of jobs based away from the parish itself. Winsham is known to have existed a thousand years ago, because it is recorded in the Doomsday Book. Its oldest Church was built in the fourteenth century. A school has existed in the village since the eighteenth century, but the existing school building dates only from the 1850’s,when it had more pupils than it does to day. Winsham also had, for a fleeting moment-about fifty years-a woollen mill, becoming later a Flax mill, situated by the river. On the face of it, one would be forgiven for thinking that Winsham does not offer much reason or scope for attempting to record its history. You would be wrong! It seems to us that there exists a great deal of latent interest among the present population for information about the lives of the earlier inhabitants of the village. Whenever the opportunity arises there is always good support for any attempt to recall Winsham’s past. Street Fairs; VE Day Celebrations with the accompanying exhibition of memorabilia from World War 2; the Millennium Book, a record for the future generations of Winsham people. Old photographs are pored over, and the older generations love to talk about life as it was fifty years ago. More importantly, people love to listen, providing they haven’t heard it too often before! On a wider front, the reality is that many people are interested in history, local, national and international, and the evidence for this is to be found in the tremendous volume of coverage by TV, radio, magazines & books. The people of Winsham are no different. The principal problem for a small community attempting to record its history is often the lack of facility for storing information gathered, as well as being able to make it readily accessible to those who wish to view it. Some years ago there was a movement in the village to set up a small conventional ‘bricks & mortar’ museum, but without success. The problems of finding a suitable permanent space, and the associated problems of cost of refurbishment, heating, lighting, cleaning, control of access were daunting. Add to this the cost and organisational problems associated with preparing and maintaining good quality displays, and it becomes clear that the conventional approach to museums was not an option for a small village such as Winsham. In the course of discussing these problems with County Museum experts, they suggested that a ‘virtual museum’ using a web site on the Internet. At the time the suggestion was not met with much enthusiasm. To explain this it must be remembered that in the middle of the last decade, the Internet was nothing like as well established as it is now. Furthermore, home PC ownership was nothing like as widespread, and building a website did not seem possible as we had no knowledge of building web sites. This is how the matter was left for some three or four years. 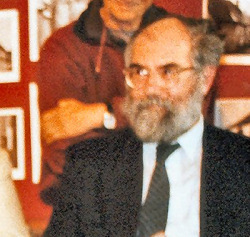 David Dawson, County Museums Officer, whose idea in1996 sparked the idea off. The trigger for the renewal of interest in the idea was the death of two elderly villagers. The realisation that they had taken with them to the grave a great store of memories and experiences of most of the twentieth century, which would have been of great interest to many people, was depressing. In addition to their memories of their own life, they had, in all probability received the recollections of their parents and grandparents. Access to maybe a century and a half of history of these two people was lost, and some of this at least was Winsham history. The one and a half centuries involved are also of particular significance. Just think of how much has changed in the world during that time. The manner of how these changes would have influenced life in a small rural village in the west of England is something that fascinates many. Clearly something needed to be done, and at a meeting of a small group of people early in 2001,it was agreed that the possibility of establishing a Web Museum should be investigated. The problem had two elements. 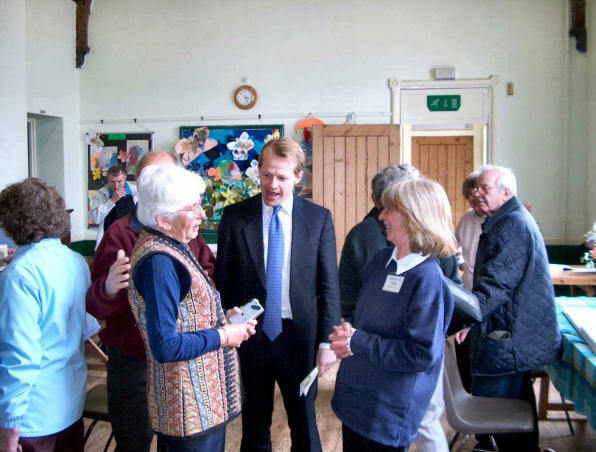 The first was establishing a management organisation that could decide how such a museum should be structured to provide a comprehensive repository of relevant village and parish historical information, and then how to gather and present the material. The second was how we would cope with the technicalities of building a web site, bearing in mind that very little experience of web site construction existed within the group. The problems were initially very daunting, but in practice they were quickly overcome. Dealing with the problem of building the web site first, we did have a large slice of good fortune. Contact was made with the Website Manager of South Somerset District Council. It was an obvious first step to take, because Winsham already participated in the Village Web Site initiative which he had organised. The idea of the virtual museum was received with enthusiasm, and we were given a good deal of information about the things that we would need to do. We were, most importantly, offered practical help in constructing the site, and some temporary space on the SSDC site on which to build a test site, which would be accessible only to those authorised. In practise it enabled the group to proceed with the other element of the museum, the structuring and preparation of material for the museum. In retrospect we sometimes wonder if our Web Museum project would ever have got started without the initial technical support from the SSDC's Website Manager. This must be an area of concern for any group considering such a project, without much computer and web site experience. The answer is that with sufficient determination it would have progressed, although it would have taken longer, and the on-screen result might not have been as professional. Would that have really mattered? The time taken on the project, and the speed of its progress is not the main issue. The most important thing is that material, which might otherwise become lost, is recorded digitally. Of course the standard of presentation is important, as this will improve accessibility and readability and encourage people to revisit the site on a regular basis. A community history web project can never reach a conclusion. It is ongoing, with today's events becoming tomorrow’s history. 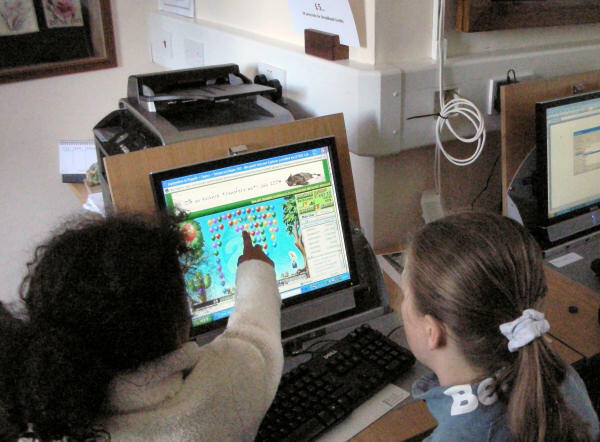 We did have one person in our group who had limited experience of web site construction, and another two or three who had experience of computer graphics. With the ever-increasing amounts of ‘build your own web site’ software becoming available, we could have achieved a worthwhile result. Furthermore, our IT expert, who also teaches web site design at the evening classes at the local technical college assures us that any of his students who had completed his 16 week course would know more than enough to achieve a result comparable to our own web site. A long-term view is essential, although a reasonable sense of urgency is needed on a day-to-day basis to ensure that work on individual items of display and recording do get completed. One piece of advice remains fundamental to any project of this nature - KEEP IT SIMPLE! With regard to the structure of the museum, we concluded that the best way forward for us was to imagine our ‘virtual museum’ site as a vast empty open plan building, capable of limitless expansion, which we could divide up as we chose. We would have an entrance hall. This would be our ‘Home Page’. It would contain an interesting exhibit to whet the appetite of visitors, display the main contents of the museum, and give directions for moving around. We felt that we should have a series of ‘galleries’ designated to the main areas of interest. The ’Winsham at Worship’ gallery would, for example, be devoted to recording the history of worship in Winsham over as long as period as possible, and would include as much information as we felt would be of interest on religious activity. This gallery would be divided up into ‘rooms’. One room would relate to St.Stephen’s Church, our parish church which dates back to the 14th century. Another room would house information about the United Reformed Church in Fore Street. A third room might be used for the history of the Gospel Hall, belonging to the Plymouth Brethren (but which no longer in existence, having been converted into a house), if information about it could be found. St. Stephen’s Church ‘room’ contains displays on the Bells, the Rood Screen, the Choir, etc, and if you look at the Rood Screen ‘showcase’, you will find that within this there are various levels of information accessible. We then produced a long list of subjects that could be used for galleries. ‘Winsham at Work’ would house information about how people earned their living in Winsham over the centuries. It might have two rooms; one devoted to Agriculture the other to all other types of work activity and businesses. ‘Winsham at Play’ would encompass all the information we could find about the leisure activity of the people of Winsham over the years, displayed within the same general framework as described above. We have attached an Appendix giving the list of galleries and rooms, etc that we are considering for the future. They represent many years of future work. The principle is proving to be a good one, although we do sometimes run into problems in deciding where a particular exhibit should appear, or inconsistencies develop between the galleries. You do not need to look very far to find them, but eventually they will be overcome. The problem of duplicate requirement is not serious because with a web museum the same exhibit can appear in more than one place as required. It was agreed that it was important to establish the presence of the museum as quickly as possible, if only for the sake of morale and keeping the interest of the group. To do this we were attracted to those areas of Winsham activity that would respond reasonably easily to investigation and display. The Natural Science gallery in its present form was the first to be completed, followed by a major part of ‘Winsham at Worship’ and ‘Winsham School’. Starts were also made on a number of other subject galleries, and these are being added as soon as significant elements are completed. No gallery, room or display can ever be regarded as completed as the potential to add to it always exists. We are finding that the information which interests village people the most is information about earlier Winsham people, but more about that later! Initially all the work on gathering material and writing it up for the museum was focused on the members of the initial group. Discussions were held on how the museum should look, and all sorts of ideas were floated, including suggestions about typefaces to be used, and, fancifully, the possibility of having little cartoon characters lurking in corners of galleries, ready to act as guides, rather like the cartoon Office Assistants which appear in some versions of ‘Microsoft Office’. These were quickly dropped when our website guru explained the realities of programming in such creatures, and the need to use type styles that would be recognised by the various operating systems used by visitors to our site. The merits of keeping it simple were underlined once again. By this time news about the construction of the museum website began to get around the village. Initially it was not met with universal enthusiasm. A few were a little suspicious of what might be involved, valuing understandably the privacy of the small village. However a substantial body of opinion was in favour, and we just had to accept that we would need to work hard at winning the others over. Our computer expert also had a problem. In all fairness he had given us a good start, but we could not expect this level of support to continue indefinitely. Furthermore the volume of work was increasing quite substantially. We could not reasonably expect to continue to nest in the quiet corner of the SSDC site that had become our home. Once again we were very fortunate. 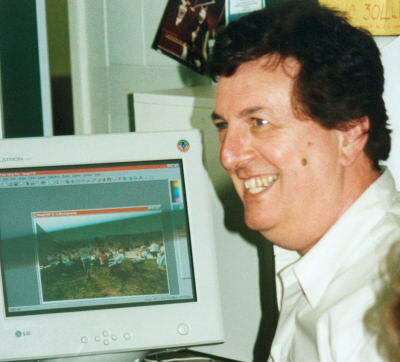 Our IT guru, Bob Osborn-picture left- (having lived for several years in the village) decided that he would join our committee as a private individual, and continue to work with us in his own time - something he had been doing anyway. He also suggested that the time was right to acquire our own domain name, which in our case came along with unlimited web space for some £60 for a two-year period. This raised an interesting point. What would we do for money? We were nearly at the end of our first year of existence and we had not spent any money, apart for the occasional film, the cost of which individual members had met out of their own pocket. Clearly we could have raised the new domain charges among ourselves, but we felt that it would be a good idea to offer the Parish Council the opportunity to be associated with the project by meeting this expense for us. This they agreed to do. In return we named them as a sponsor, which sent a clear message to any doubters that the Parish Council approved of our efforts. As our efforts began to bear fruit, a number of other ideas and problems began to emerge. As far as we could tell, only about half the village was on line. This figure is significantly higher among the younger age groups, and lower in the older people. This is likely to increase in both demographic groups as the years go by. Nevertheless, their are a significant group of older people who will never have an ‘on line’ facility. This group is also of especial importance to us as they are the repositories of a great deal of information about the first half of the last century. In addition to them being the source of a good deal of documentary evidence such as photographs, letters, etc, we also needed to tap their reminiscences, and record their accents and use of words. To enable older people to see the Museum, bearing in mind that some are housebound, or at least not very mobile, we needed a laptop, working with a Museum ‘back-up’ disk in order to visit these older members of the community. To record their words we would need some portable recording equipment of reasonable quality. We had already tried using an ordinary cassette recorder for this purpose, with brilliant results as far as content is concerned, but with very poor sound quality. It was also becoming clear that the time was approaching when we should appeal to the parish in general for help in our project by persuading them to share with us their memories. We were looking for photographs, artefacts, documents and reminiscences that we could scan, photograph or record. All of a sudden the realisation came upon us that we needed some money, ideally a substantial amount. We needed a laptop computer, a minidisc recorder and microphone and the funds to run an ‘Antiques Road Show’ style event over a weekend to put the museum ‘on the map’ with the parish and to gather in material. We needed about £4,000. We made an application to ‘Awards for All’, which distributes lottery money, and successful in making our case. Not that it was just as easy as that. Applications need to be made with great care, and a bank account needs to be set up in advance of making the application. To set up a bank account you need Officers, i.e. a Chairman, Secretary, and Treasurer and a written Constitution. You do not need any money, although somebody did lend the museum £10 in order to get a printed statement, which ‘Awards for all’ needed as evidence of a bank account. 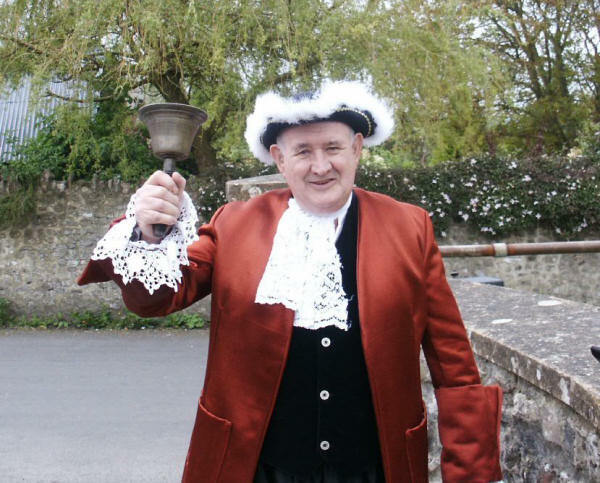 (Picture-A Town Crier -Ian Jackson-was recruited from Davies Close to help launch the Web Museum). Meanwhile the museum continued to develop at a satisfactory rate, some galleries and rooms progressing faster than others. We put no time pressure on our contributors other than to ask them how long do they think that their work will take. At the end of that period we ask them to report on progress. This fairly relaxed approach works. It encourages busy people to participate, when the possibility of their being pressurised might scare them off. The Web Museum is an ongoing project, and we do not have any particular deadlines to meet.